We in Suffolk are slightly bemused by a recent announcement that we are to be re-branded as The Curious County. Does this mean that we go about poking our noses inquisitively into everything? We certainly like to poke about the many many churches we have in the county, and we love looking around our historic buildings, of which we blessed with a great many. 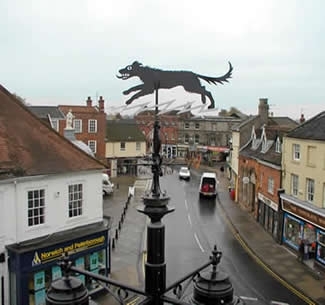 And looking into our spooky histories, especially here in Bungay where we have our very own Black Dog legend. Yes, I concur, we do have an innate curiosity. Or does it mean that we are simply odd? There is the 'House in the Clouds" at Thorpness; that's odd. There are some distinctly odd characters around in Bungay, but more eccentric I would say than odd and all the more loveable for it. But no more than anywhere else. We had the chicken roundabout, more unusual than odd though. The chickens, which were there for over 30 years, pecking away on the roundabout and the verges around it, roosting in the trees, were a delight for many as they neared Bungay from Norwich or Beccles. But they went a couple of years ago as Gordon Knowles, a lovely local character who fed them, retired heartbroken after so many were stolen. The last few were rehomed. Now a group of us are planning on commemorating them in the form of metal chicken-shaped silhouettes on the roundabout and we are seeking all the permissions we need. Is that odd? No - it's fun! We've even attracted the attention of the BBC! http://www.bbc.co.uk/news/uk-england-20093122" target="_blank"
So - curious about the new soubriquet for our county? Here's more media coverage this time from the Guardian!